I love simple layouts for my card designs and this one is a classic layout that packs a whole lotta punch. I used the a strip of the Merry Little Christmas DSP #144621 and added a thin daffodil strip just beneath to make it pop. I hand cut the sunflowers from the Painted Autumn DSP # 144613 from Stampin Up and then added a black mat and re-cut them out again. I added the sentiment to a double matted Stitched Shapes Framelits #144613. Happy Birthday 19th to our sweet niece Elizabeth aka Sissy! 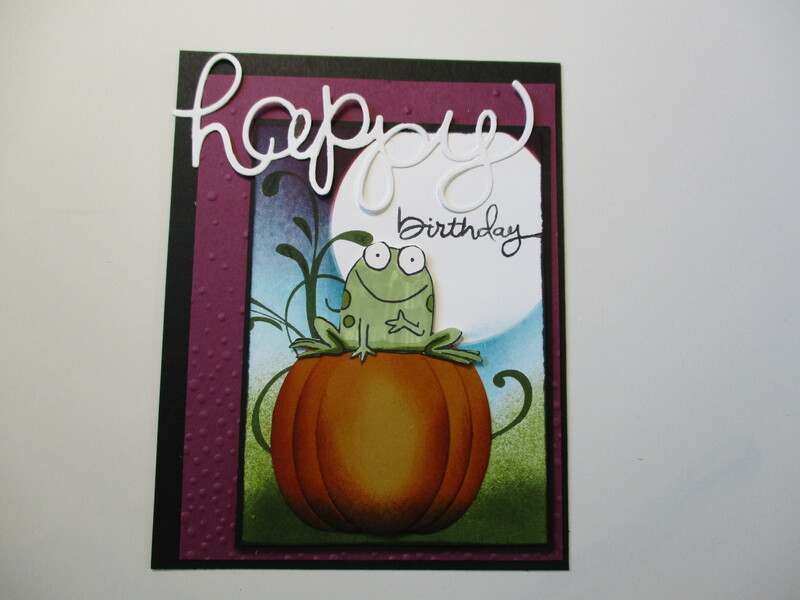 She missed having a Halloween birthday by a few hours so it is appropriate to honor her with a pumpkin card. This card is one another one of Cammie’s beautiful brayered cards. She created the perfect brayered background and accented the sky using the Everything Eleanor #131987. Cammie used the oval punches to and sponging to create the perfect pumpkin. 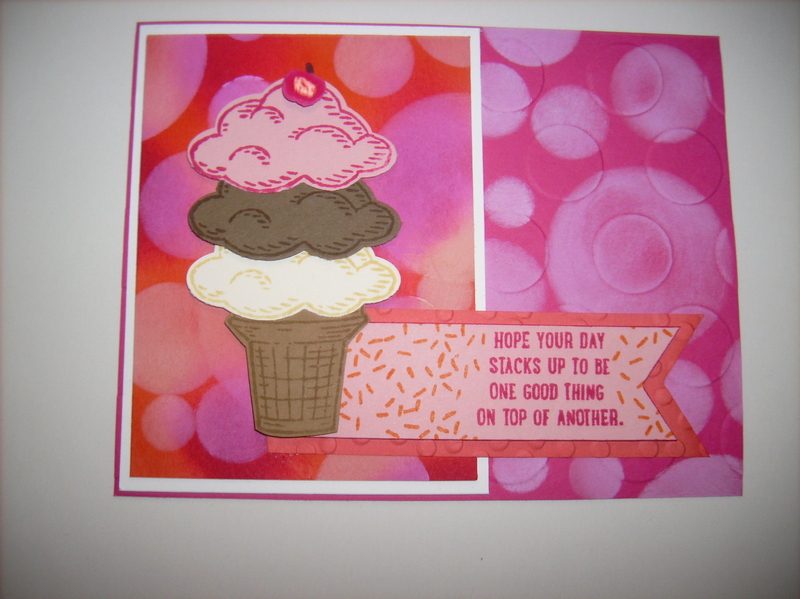 For fun she added the hand cut sweet frog from the Stampin Up You’re Sublime stamp set. 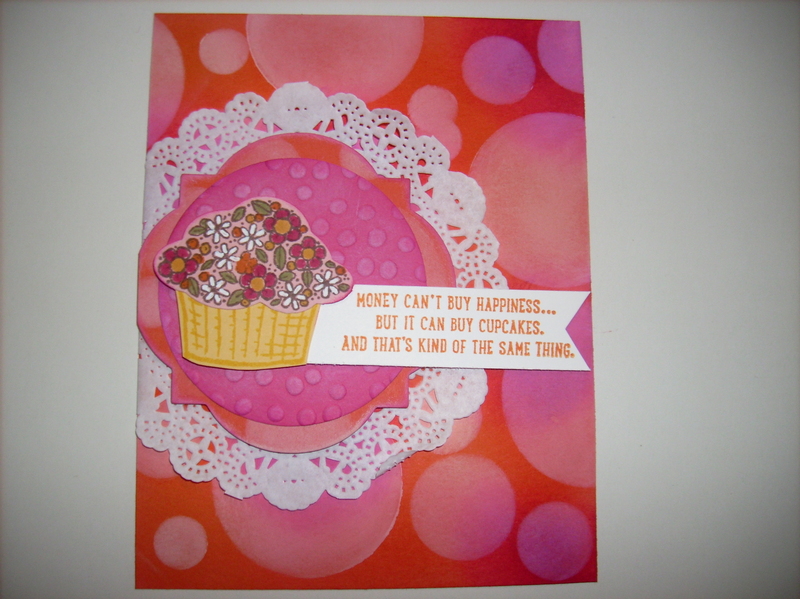 The birthday greeting was a combined message using the Hello You Thinlits #137363 and the Endless Wishes stampset #140273. The Bokeh Technique is all the rage right now and Cammie did a nice job with it on both of the cards on today’s post. “Bokeh” is a photography term for the way a camera lens renders out of focus points of light and is one of the hottest visual trends in design right now. And paper crafters have taken a hold of this and termed the process for creating this illusion with ink and paper the “bokeh technique.” The bokeh technique generally is a circle of chaos of various blurred circles. Cammie created her Bokeh backgrounds and then used the Stampin Up Sprinkles of Life #139971 photopolymer stamp set to show case the Bokeh effect. The first card is a layer intensive card using the paper tea lace Doilies #129399 and then Window Framelits (no longer available) and then a circle textured with the Decorative Dots #133520. The cupcake was stamped using the Sprinkles of Life stamp set and then each piece was cut using the coordinating Tree Builder Punch #138295. Cammie added the sentiment on a hand cut banner. For the second card Cammie used the same color scheme for her Bokeh technique and the same Sprinkles of life stamp and coordinationg Tree Builder Punch to make a muli layered icecream cone. My husband and I recently went to AZ to visit his mother and her husband. Anyone who knows me knows that I love cacti-especially “cacti with arms”. Seeing these saguaro cacti in a quintessential AZ sunset was on my bucket list and when we went to Tuscon I got to see these beauties thriving complete with the AZ sunset. So my post today is the thank you that I made for my mother-in-law. My sunset was brayered and sponged using lessons that my sister Cammie taught me awhile back. I am not comfortable with brayering but I think this card turned out pretty well. 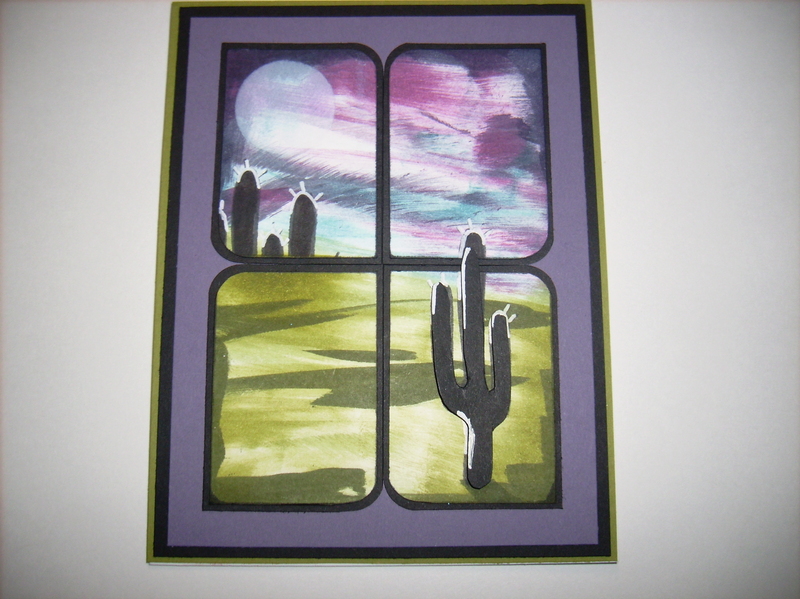 I added the Saguaro cacti from the Stampin Up Yee-Haw polymer stamp set #138107 and the desert brush was added using the Wetlands #126695. Thanks for a great trip and beautiful memories and wonderful weather! I have always been in awe of the Saguaro cactus. Known for its tall, branching shape, the saguaro is a true icon of the Arizona desert. We will be vacationing in AZ soon and I can’t wait to see the “cactus with arms”. So when I received this card from Cammie I was over the moon with all it’s glory. 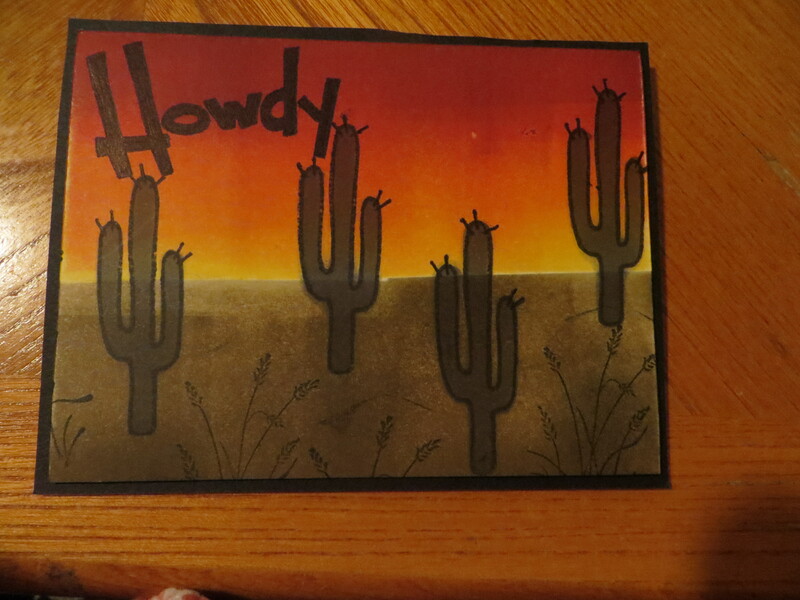 Cammie used the direct to paper method to create the Arizona landscape and the saguaro cacti were stamped using the Stampin Up Yee-Haw #138107 stamp set. Cammie has been spending the last few weeks in warm and sunny Jamaica with her husband and several friends. She made these cute journals to give to all the vacationers so they can jot down their memories. 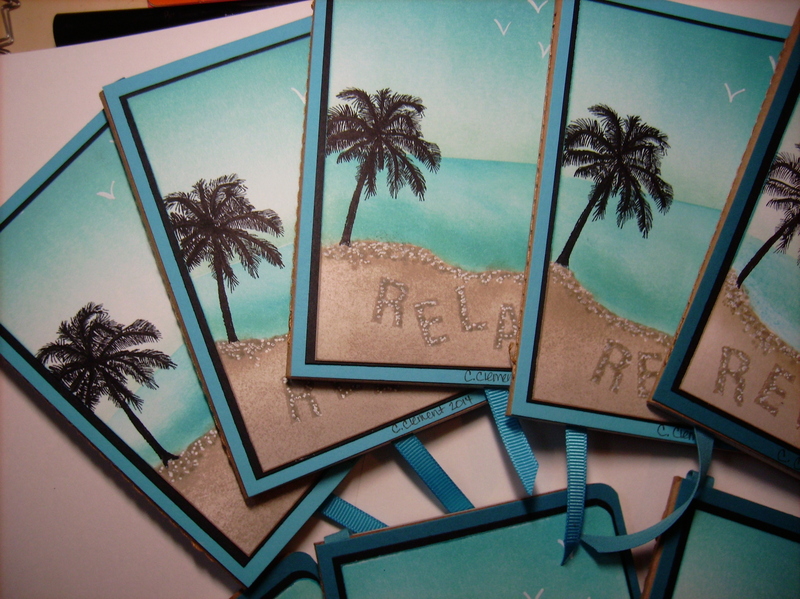 The base of the journal is the Stampin Up Kraft Grid Journals #135718 and then she went to town creating a very relaxing beach scene using her master brayering skills and Stampin Up inks. Once she returns from her Jamaican holiday you can be sure that she will be ready to create new stuff using the new products available in the Stampin Up Occasions catalog and the annual Stampin Up Sale-A-Bration campaign.